Space exploration has long been a dream for mankind. Science fiction is full of stories about it. In fact, it's more than a dream today. American astronauts have actually been to the moon, and unmanned satellites have visited Venus, Mars, Jupiter, Saturn, and beyond. More exploration, mostly unmanned, is planned. To explore very far, it is clearly cheaper and safer to send unmanned equipment. For one thing, the equipment does not have to come back. For another thing, machines don't need food and water. They can subsist on solar, or "stellar" energy. Space colonization is another dream. Although twelve Apollo astronauts actually walked on the moon, they were only visitors. To establish a colony on the moon, people would need to take enough air, water, food and supplies to last ...however long the people wanted to live there. Or we could keep resupplying them. Or maybe they could construct a shelter and get some of life's processes going inside it. Probably, in an enclosed environment they could recycle the air and water. Maybe they could get some kind of agriculture going to supply the food. 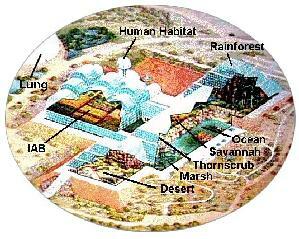 Not on the moon, but in Arizona, a kind of model Earth was constructed. A shelter called Biosphere 2 was built to sustain eight adults in complete environmental isolation in a self-sufficient ecosystem for an indefinite period. The construction cost about 150 million dollars. The first closed experiment began September 26, 1991, and ran for two years. But the isolation was not really complete: the temperature was stabilized largely by Earth's atmosphere, medical treatment was supplied from outside, and the air had to be completely replaced occasionally. Building and maintaining such an artificial environment on the moon would be more expensive by a large factor. And it would be riskier by an even larger factor. One way to establish a space colony would be to send unmanned spaceships first, carrying robots to set up the protected environment our colonists would need. This would save money, other resources, and probably lives. Of course, they would need to be some pretty sophisticated robots. But we're talking about the future, and in the future technology will be more powerful than it is today. It might even be possible to make robots that could reproduce themselves. That way, the failure of a few units wouldn't kill the enterprise. If the same robots could act as their own spaceships, the system could conceivably travel far beyond our solar system. Self-reproducing robots that could travel through space and colonize planets could even be considered a new kind of life. They would definitely require extremely advanced technology. You can archive all the data on the internet in a shoebox — Luis Ceze, [quoted in] The Wall Street Journal, 26 Oct 2016. One technology to consider is genetic engineering. It is powerful and ready to use. DNA can contain thousands of times as much information, per unit of weight or volume, as any computer-related technology today . And bacterial cells can multiply by a factor of one trillion (10^12) within 40 generations. If the reproductive cycle is less than 30 minutes, as it is with E. coli, 40 generations take less than one day. This technology is available right now. Within the past twenty years, we have learned how to manipulate biotechnology by genetic engineering. Already we've learned to do some pretty fantastic things. We have engineered bacteria that can consume nasty pollutants. We've inserted genes that make E. coli produce insulin. In 1990, French Anderson of the National Institutes of Health administered genetically altered blood to a child with a rare inherited disease, and the child appears to be cured (2). It is reasonable to suppose that in the future we could send genetically engineered bacteria to the moon to make its environment suitable for us, the same way cyanobacteria and other bacteria made this planet suitable. On the moon we would need to create an atmosphere we could breathe, a stable and comfortable temperature, and plenty of water. Of course, the moon does not have any air or water right now. These problems might be insurmountable. Water is required by all bacteria ever discovered, and all the rest of life as well. Maybe we could engineer bacteria that could survive without water. But we can't survive without water. Unless we can engineer bacteria that can manufacture water, maybe we should look for a more suitable place to colonize. Mars, for example, has air and at least had water (3). Now there is evidence that Mars once harbored bacterial life. Still, it's hard to know if life could succeed there today. Since our genetically engineered bacteria are tiny and inexpensive to ship, probably we should just send them out to all the solar planets and see where they succeed. That's the safest bet. Then, when we can see from Earth that the climate on one of the planets has been converted to suit us, we can move in. Of course, that conversion might take a while. On Earth itself, it took about three billion years. What if the conversion took that long on the other solar planets? What if it was never successful on any of them? We can't wait billions of years just to find out if it will work. Besides, five billion years from now the sun will blow up. It will become a "red giant," so big that Earth will be inside it. We'll be goners for sure then. Even if our colony on Mars had been viable, it will get cooked too. Maybe something on Neptune or Pluto could survive. What if we hadn't been able to get life going there? We could be extinct in a few billion years if we don't do something. Of course, other unforseen perils may threaten us with extinction long before the sun blows up (4). One of the good things about bacteria is how small they are. That makes it cheap to send out lots of them. If we could send them beyond our solar system in every direction, they would have many more chances to find a colonizable planet. In case habitable planets are hard to find, we had better send them to every reach of the galaxy. But now we have a new set of problems. First, how will they get out into the far parts of the galaxy? It was not hard to imagine eight or ten spaceships, one traveling to each of the other solar planets and maybe some of their moons, all within a few light-hours. But there are probably hundreds of billions of planets in our galaxy. And the galaxy is a hundred thousand light years across. Hundreds of billions of spaceships, most traveling thousands or tens of thousands of light years? The fuel, material and total cost of the enterprise is hard to even grasp. We need to consider another way for them to travel. Would it be possible to utilize some available transportation, to send the bacteria into space in all directions? Is there some kind of cosmic interstellar traveler they could ride on? Something that would keep them protected from radiation damage on the way? Something with a trajectory that would ultimately lead to the dispersal of our bacteria well out into the galaxy? Yes, as we know, there is. Comets. But comets can't be steered. Can they? Riding on comets, probably 99.9 percent of our bacteria will never arrive at any planet. To maximize our chances, just send lots of them. We won't even think about the ones that don't make it. How will we get our bacteria loaded onto the comets? How are comets formed anyway? This is not known for certain. Fred Whipple thinks they formed by the accretion of interstellar gas and dust. This could happen at the edge of a gas cloud that is forming a star, or it may happen independently of star formation, in giant molecular clouds. Whipple prefers the first idea, but he acknowledges, "an appreciable fraction of the huge mass of interstellar clouds may actually be comets" (5). How comets originated is still under scrutiny (6). Maybe we could send one huge spaceship full of bacteria to the regions where comets are formed. Or maybe bacterial spores could ride on light pressure, as Arrhenius supposed, to those regions. Maybe when the sun blows up they could surf out on the first shock wave. At left is a Hubble Space Telescope photo showing gas and dust being stripped from stellar objects (designated "cometary knots"), very much larger than typical planets, by the explosion of the Helix Nebula. Perhaps biological material could be disseminated in a similar manner. Some problems with this scenario — how to shield microorganisms from radiation, and how much radiation is required to propel microorganisms so shielded — have been analyzed by Jeff Secker et al. (7, 8). With our ultimate survival at stake, we can probably solve this problem. In the future there'll be lots of difficult problems to face besides this one. Hoyle and Wickramasinghe calculate that the amount of biological material in the interstellar dust in this galaxy exceeds the mass of Earth by a factor of about a trillion (10^12) (9). They estimate the amount carried by comets, in this solar system alone, could be fifteen times as great as the mass of Earth (10). It stands to reason that there would have to be lots of it if life is likely to get established on many planets. And it would require a special explanation if biological material were concentrated around only our planet, Earth. But when we are ready to launch our pioneering colonists, we simply won't have enough material to make that quantity of bacteria and viruses. Our initial contribution to cosmic life would be minuscule. But maybe a small contribution would be sufficient. Comets could act as the amplifiers we need; the exponential growth of our bacteria and viruses could happen there. If so, we would need to launch only a small quantity of bacteria and viruses. Heat sufficient for bacterial metabolism could be supplied in comets by radioactive material, which is abundant during star formation. Alternatively, the stars themselves could supply the warmth. 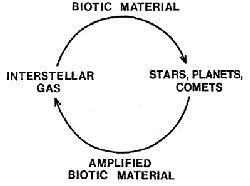 After a comet develops an orbit that brings it close to a star, bacterial metabolism could take place then, near the star. The biggest problem we will face, to establish a human colony on a distant planet, will be getting there ourselves. First, we will have to wait for our bacteria to reach another suitable planet. Traveling on comets, to planets which could be thousands or tens of thousands of light-years away, the bacteria could need millions or billions of years just to get there. Then we would have to wait the additional billions of years it might take them to convert a planet into a suitable habitat. Then we will have to identify and locate that planet, even though it can't signal to us, and could be fifty thousand light-years away. Then, we will have to travel there ourselves. Guess what. We'll never make it. We've got a problem. Is there any way we could go with the bacteria? Could we genetically engineer ourselves into bacteria? Could we become cosmic ancestors? If we could load all of our own genes onto space-traveling bacteria, we could eliminate the long wait, the difficult search and the long, risky, expensive rendezvous voyage. It would mean a one-way trip, with no calling home. And this way, it wouldn't matter how long the trip took. This way, once our bacteria happened to land on a colonizable planet, we'd be there! This way, we could almost leave now if we had to. Of course, it wouldn't be us exactly. It would be our genes. Our actual human descendants wouldn't emerge there for several billion years probably. But if this were our only chance to survive, we'd do it, wouldn't we? We already know the progress that genetic engineering has made in only one generation. In fact, by 1987, placing the entire human genome into 250,000 plasmids — smaller genetic fragments carried in cells, outside of the main chromosomes — was "now essentially a trivial problem" (12). Imagine what might be possible in 40 human generations, a thousand years from now. Imagine genetic engineering a million years from now. It is not hard to believe that by then we might be able to place into bacteria, or bacteria plus viruses, all of our own genes, and all of the genes for all of the other creatures that ever lived here. And we might learn, in the future, that there are other possible kinds of environments where other kinds of intelligent creatures might thrive. If the genetic programs for those kinds of life could be written, or found, we could include them as well. That would further increase the chance of our ultimate success. Developing biotechnology that can make bacteria evolve into all of the most highly organized forms of life, including people, is an interesting problem. On a distant planet, it will have to happen "hands free," because we won't be there to guide it. First, of course, the bacteria will have to get a foothold. So they will need to have a wide range of abilities to withstand all sorts of environments. As we know, extremophiles like that are available now. Next, as we have discussed, bacteria that can engineer the planet's environment will have to multiply, swarm all over the place, and make some difference. Exactly what properties they'll need to have is hard to anticipate. We know generally what we want the environment to become, but we don't know exactly what environment we'll be starting from. We should probably make every conceivable property available in the first bacteria. Or available to them from viruses. We should include ways for them to swap properties, to mix and match. Of course, bacteria can do this anyway, but bacteriophages, the viruses of bacteria, can speed up the process. Bacteriophages can amplify the availability of certain properties that turn out to be helpful even faster than the bacteria by themselves can. The exact result of all the bacteria, interacting with each other, getting feedback from the environment and affecting it is tough to anticipate. We should build in as many stabilizing feedback loops as possible. We will definitely need the help of Gaian processes. If a mature science of complex systems were to turn its attention this way, it might help. Assuming that the environmental engineering goes well, we want to enable eukaryotes to emerge. Eukaryotes are the only kind of cell we know of that can evolve to multicelled life. Probably we should take advantage of the symbiosis that Lynn Margulis told us about: provide the bacteria that could become the mitochondria and the plastids in plants. Of course there'll be plenty of other necessary steps, probably requiring some serious microevolution, or sideways steps, on the part of bacteria. We should probably allow plenty of time for the evolution of eukaryotes. It could be difficult. It's worth wondering whether we could actually send out eukaryotes, too, on the comets. Some eukaryotes form spores, we already know, but that doesn't mean they could survive in space. Besides, even sending eukaryotes, we would still have to wait for the bacteria to engineer the environment. Anyway, once the eukaryotes have become established, evolution on the new planet can really make progress. Now, using viruses and bacteria as couriers, eukaryotes can install and swap all kinds of genetic software. The software should be specifically targeted for application only if other compatible software is already installed. The infecting agent should be species-specific, in other words. Sexual reproduction with "gene conversion" will enable us to transfer very large genetic programs, over generations, without loss of accuracy. Again, we will want to make available every conceivable feature, because we can't be assured from here that the new world will be just like this one. As soon as environmental conditions are just right for multicelled creatures, they can then emerge in the broadest variety, like an explosion. Subsequent natural selection can then eliminate some of the less suitable kinds and leave the field open for the remaining, better-suited kinds of animals and plants. A way for features to scale up and down would be helpful. If for example, the new planet has stronger gravity than Earth's, stronger bones would be good. If the air is thinner, bigger wings might be helpful. And a standard system for embryological development, sharing the same coordinating genes would be good. Keep it simple. Similarly, cosmic life would benefit from metabolic and reproductive systems that are able to synchronize with planetary daily, seasonal and annual rhythms — aligning with regular cycles in temperature, radiation, moisture and gravity, for example. It might be advisable to try to establish stacks for large genetic libraries on the new planet, so features that are not in use can be preserved for the future. Maybe we could get some genetic process to expand the genomes of some animals and plants so that their chromosomes would be big enough to act as library stacks for others. Perhaps the process of just repeating a sequence many times could serve to enlarge the chromosomes, creating more shelf space. We know that salamanders and lilies have huge quantities of silent DNA. Maybe their counterparts on the next planet could act as the stacks we may need. To make the stacks available to all, some viruses will be able to move genes across species boundaries. Using fleas, ticks, mosquitoes and other transportation systems could speed this up. And of course, if sufficiently intelligent life does evolve, genetic engineers will be able to move genes around at will. The role of chance in this evolution is, of course, an important one. The relative success of one kind of creature versus another is hard to anticipate. It would be good to think of the process as tinkering. New genetic programs will be continually offered for testing. If it works, it stays. So there will be an important role for natural selection. There will even be a role for mutation. Genes can be turned on and off by other genes that act as activators or repressors. These activators and repressors can themselves be disabled and sometimes even reenabled by point mutations. The rate at which these mutations occur can possibly be enhanced by environmental stress. This kind of rate enhancement, "adaptive mutation," has been observed recently (13-17). So there is definitely a place for mutations. But mutations won't be expected to add meaning to any creature's genome. We wouldn't expect mutations to write new genetic software. 21 Dec 2017: Mars advocate Robert Zubrin favors panspermia. China takes aim at the Moon with long-term cabin trial, BBC News, 11 May 2017. Epigenetic Regulation of Biological Rhythms: An Evolutionary Ancient Molecular Timer by Tyler J. Stevenson, doi:10.1016/j.tig.2017.11.003, Trends in Genetics, 05 Dec 2017. The hypothesis proposed is that an epigenetic clock serves to maintain the period of molecular rhythms via control over the phase of gene transcription and this timing mechanism resides in all cells, from unicellular to complex organisms. The model also provides a novel framework for the timing of epigenetic modifications during the lifespan and transgenerational inheritance of an organism. Environmental change drives accelerated adaptation through stimulated copy number variation by Ryan M. Hull et al., doi:10.1371/journal.pbio.2001333, PlOS Biology, 27 Jun 2017. ...a pathway by which mutations can be directed to particular loci in particular environments and furthermore that this mutagenic process can be regulated through histone acetylation. Stimulated CNV therefore represents an unanticipated and remarkably controllable pathway facilitating organismal adaptation to new environments. ...Tiny Interstellar Probes May Test 'Panspermia' Idea, by Mike Wall, Space.com, 10 May 2017. 26 Sep 2016: The Genesis Project: a proposal to undertake directed panspermia. Mission possible: Rewriting the genetic code by John Bohannon, re: Design, synthesis, and testing toward a 57-codon genome by Nili Ostrov, Matthieu Landon, Marc Guell, Gleb Kuznetsov et al., doi:10.1126/science.aaf3639, Science, 19 Aug 2016. A New Empirical Constraint on the Prevalence of Technological Species in the Universe by Frank A. and Sullivan W.T., doi:10.1089/ast.2015.1418, Astrobiology, May 2016. Hunting for hidden life on worlds orbiting old, red stars by Blaine Friedlander, Cornell University (+Newswise), 16 May 2016. "Long after our own plain yellow sun expands to become a red giant star and turns Earth into a sizzling hot wasteland, there are still regions in our solar system - and other solar systems as well - where life might thrive," says Lisa Kaltenegger, associate professor of astronomy and director of the Sagan Institute. Primate evolution in the fast lane: Mechanism discovered that creates 'clusters of mutations' that affect traits by Melissa Osgood, Cornell University (+Newswise), 07 Apr 2016. The "Wow! signal" of the terrestrial genetic code by Vladimir I. shCherbak and Maxim A. Makukov, doi:10.1016/j.icarus.2013.02.017, Icarus, May 2013. We show that the signal is statistically significant,... and untraceable to natural origin. Heather A. Flores et al., "Adaptive Evolution of Genes Involved in the Regulation of Germline Stem Cells in Drosophila melanogaster and Drosophila simulans" [abstract], doi:10.1534/g3.114.015875, G3, online 9 Feb 2015. Adam Frank and Woodruff Sullivan, "Sustainability and the astrobiological perspective: Framing human futures in a planetary context" [html], doi:10.1016/j.ancene.2014.08.002, p 32-41 v 5, Anthropocene, Mar 2014; and commentary: Sustainability, Astrobiology Illuminate Future of Life in the Universe and Civilization on Earth, University of Rochester via Newswise, 6 Nov 2014. 7 Jul 2014: ...Horizontal gene transfer ...need not be random. David Enard, Philipp W. Messer and Dmitri A. Petrov, "Genome-wide signals of positive selection in human evolution" [abstract], doi:10.1101/gr.164822.113, Genome Res., online 11 Mar 2014. 7 Mar 2014: "Traditional evolutionary biology...", from an article largely about "adaptive mutation." Artem G Lada et al., "AID/APOBEC cytosine deaminase induces genome-wide kataegis" [abstract], doi:10.1186/1745-6150-7-47, v 7 n 47, Biology Direct, 18 December 2012; and commentary: ...rebellious enzymes: mutation showers in cancer induced by APOBEC 'kataegisters', Biome, 22 Jan 2014. R. Craig MacLean et al., "Evaluating evolutionary models of stress-induced mutagenesis in bacteria" [abstract], doi:10.1038/nrg3415, P221-227 V14, Nature Reviews Genetics, Mar 2013. "Increased mutation rates under stress allow bacterial populations to adapt rapidly to stressors...."
Half a Million DVDs in Your DNA by Robert F. Service, ScienceNOW, 23 Jan 2012. 20 Jan 2012: Recent gravitational microlensing observations predict a vast population of free-floating giant planets that outnumbers main sequence stars almost twofold. Easily 'Re-programmable cells' could be key in creation of new life forms by Natalio Krasnogor, The University of Nottingham (also Physorg.com), 7 Nov 2011. Opinion: Synthesizing Life: "Designing genomes from scratch will be the next revolution in biology," by J. Craig Venter, The Scientist, 1 Oct 2011. Scour Earth for traces of intelligent aliens by Lisa Grossman, NewScientist, 7 Sep 2011. "Aliens may even have left deliberate messages in our DNA, Davies says." Will colonizing meteorites and asteroids with bacteria one day save life as we know it? by Alex Ballingall, Maclean's, 20 Jul 2010. Could Life on Earth Have Come From Outer Space Deliberately? by Michael Mautner, Science and Religion Today, 7 Jul 2010. 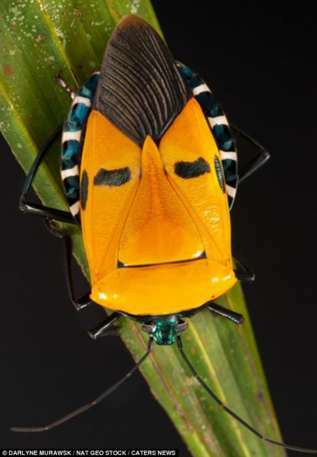 A stinkbug resembling Elvis! by Mark Prigg, Daily Mail (UK), 27 Sep 2012. Genes Older Than Earth? is a related new webpage, posted 8 Feb 2011. 2 Jul 2010: Gabriel Manzotti points us to "Intergalactic legacy," an article by Chandra Wickramasinghe endorsing intentional panspermia as mentioned above. Jean-Claude Walser and Anthony V. Furano, "The mutational spectrum of non-CpG DNA varies with CpG content" [abstract], doi:10.1101/gr.103283.109, Genome Research, online 24 May 2010. "...These results indicate that both mutation rate and mutational processes are contingent on the local CpG content." 11 Apr 2010: Intelligent life beyond Earth may have left an encoded message in DNA. Michael N. Mautner, "Seeding the Universe with Life: Securing Our Cosmological Future" [html], 982-994 v5, Journal of Cosmology 5 Jan 2010. Enard D, Depaulis F, Crollius HR, "Human and Non-Human Primate Genomes Share Hotspots of Positive Selection" [link], PLoS Genet 6(2): e1000840. doi:10.1371/journal.pgen.1000840, online 5 Feb 2010. "Our results show that positive selection affecting the same genes independently in human and other primates is a common phenomenon and is not restricted to specific functions such as defence against pathogens or reproduction." Three New Human Genes is a related new CA webpage, posted 4 Sep 2009. Send your DNA into space!, the Fauxist International, 17 Jul 2009. Tristan Lefebure and Michael J Stanhope, "Pervasive, genome wide positive selection, leading to functional divergence in the bacterial genus Campylobacter" [abstract], doi:10.1101/gr.089250.108, Genome Research, online 20 Mar 2009. Dacheng Tian, Qiang Wang et al., "Single-nucleotide mutation rate increases close to insertions/deletions in eukaryotes" [abstract], doi:10.1038/nature07175, p 105-108 v 455, Nature, 4 Sep 2008. One mechanism behind directed mutation? 22 Apr 2008: Richard Dawkins endorses panspermia in a movie about Intelligent Design (ID). Dale Caruso replies about Francis Crick's theory of panspermia, 9 Aug 2007. Elisabeth Kugelberg et al. "Multiple pathways of selected gene amplification during adaptive mutation" [abstract], doi:10.1073/pnas.0608309103, Proc. Natl. Acad. Sci. USA, online 2 Nov 2006. "...Selective conditions do not increase the mutation rate but instead favor the growth of rare cells with a duplication of the leaky lac allele. A further increase in copy number (amplification) improves growth and increases the likelihood of a sequence change by adding more mutational targets to the clone (cells and lac copies per cell)." Stressed Cells Spark DNA Repair Missteps And Speed Evolution — research at Baylor College of Medicine reveals a mechanism for adaptive mutation, ScienceDaily.com, 16 Sep 2005. 24 Aug 2005: More than 80 new exons per genome per million years emerge among rodents — and their mutation rate is enhanced. ...New Way of Fighting Antibiotic Resistance, by Jason Socrates Bardi, The Scripps Research Institute, 6 Jun 2005 — If the cell senses damage, and if the damage persists beyond its ability to repair it, the cell will turn on its mutation machinery and open the floodgates for evolution. Panspermia: Getting There From Here, by Richard Godwin, AdAstra, 22 Feb 2005. 9 Oct 2004: Retroelements that confer a selective advantage. DNA library on the Moon, BBC News, 8 Sep 2004. Dennis Overbye, "Sorry, E.T., but Parcel Post May Beat Phoning Home" [text], The New York Times, 2 Sep 2004. "It is enormously more efficient to send a long message as a physical package, a cosmic FedEx, than as radio wave or laser pulse." 30 Mar 2004: The body taken for an ejected planet (paragraph beginning "One way...," above) now appears to be a background star, according to Gregory Laughlin, "Are We Alone," given at the 3rd Astrobiology Conference, NASA Ames, 28 Mar - 1 Apr 2004. 2003, December 31: Stress can increase the rate of horizontal gene transfer. Adaptive mutation is common in E. coli..., Indiana University, 23 Oct 2003. 2003, November 15: Microorganisms may have spread throughout the galaxy. 2003, October 14: Genetic "fault zones"
David Malakoff, "Columbia Bids Goodbye to Biosphere," p 1455 v 301 Science, 12 Sep 2003. Ivana Bjedov et al. "Stress-Induced Mutagenesis in Bacteria" [abstract], p 1404-1409 v 300 Science, 30 May 2003. "Stress-induced mutations participate in adaptive evolution." Wojciech Makalowski, "Not Junk After All" [summary], p 1246-1247 v 300 Science, 23 May 2003. "Evolution is too wise to waste this valuable in formation." 'The end of the world' has already begun..., University of Washington, 13 Jan 2003. "Various probes sent into space could survive Earth's demise, and just a few grams of material could arguably carry a DNA sample from every human...."
Data stored in multiplying bacteria, NewScientist.com news service, 9 Jan 2003. Big Results Sought From 'Mini Earth' — "Sealed-environment project in Japan is less ambitious than Arizona's Biosphere 2. It will receive human inhabitants in 2005." Los Angeles Times, 5 Jan 2003. Lifetime of Complex Life, Astrobiology Magazine, 24 Jul 2002. 2002, Feb 28: Klyce replies to Franklin re: adaptive mutation. Justin C. Fay et al. "Testing the neutral theory of molecular evolution with genomic data from Drosophila" [abstract], p 1024-1026 v 415 Nature, 28 Feb 2002. 2001, Nov 8: "Deadalus thinks that ...junk DNA is a store of unused genes...."
2001, June 30: Adaptive mutation? 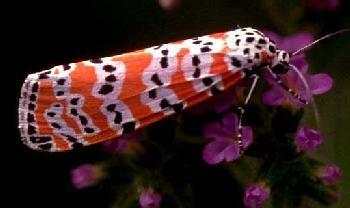 2001, May 8: American Museum of Natural History will preserve samples of species. Hawking says greenhouse effect threatens human race survival — "Unless the human race spreads into space, I doubt it will survive the next thousand years." Nando Times, 30 September 2000. Ian Crawford. "Where Are They?" [text], Scientific American, July 2000. 2000, May 9: "Reverse panspermia?" 1999, April 27: SOLIS, The Interstellar Panspermia Society, is online. "Out of this World to Another: Interstellar Trip Would Take Thousands of Years - Length: 1.2 miles. Passenger capacity: 1 million people. Cruising speed: 1.3 million mph. Cost: $20 trillion - An aerospace engineer has sketched ideas for a spaceship to carry a million people to another star," by Kenneth Chang, ABCNEWS.com 18 January 1999. Gregg Easterbrook. "Are We Alone?" p 25-38 v 262 n 2 The Atlantic Monthly. August 1988. Gregory L. Matloff and John Pazmino. 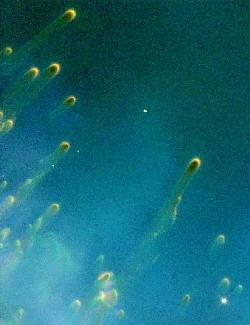 "Detecting interstellar migrations" p 757-760. Curt Mileikowsky. "Can spores survive a million years in the radiation of outer space? Part I: Protection against photons above 0.5 keV" p 545-552. Paul S. Wesson, Jeff Secker and James Lepock. "Panspermia revisited: astrophysical and biological constraints" p 539-544. Nicholas Wade. "Are We Aliens?" The New York Times Magazine. 12 November 1995. 1. Paul Feyerabend. Against Method. third edition published by Verso. 1993. p 22. 2. Joseph Levine and David Suzuki. The Secret of Life. WGBH Educational Foundation 1993. p 211. 3. Michael H. Carr. Water on Mars. Oxford University Press 1996. 4. For an interesting discussion (from a different perspective) of the likelihood of our extinction, and of colonizing space, see The Great Filter - Are We Almost Past It?, by Robin Hanson. 15 Sep 1996. 5. Fred L. Whipple. The Mystery of Comets. Washington, D.C.: Smithsonian Institution Press 1985. p 221. 6. M. E. Bailey, S. V. M. Clube and W. M. Napier. The Origin of Comets. Oxford: Pergamon Press 1990. 7. J. Secker, P. S. Wesson and J. R. Lepock. "Damage Due to Ultraviolet and Ionizing Radiation during the Ejection of Shielded Microorganisms from the Vicinity of 1 Solar Mass Main Sequence and Red Giant Stars" p 1-28 v 219 Astrophysics and Space Science. 1994. 8. Jeff Secker, Paul S. Wesson and James R. Lepock. "Astrophysical and Biological Constraints on Radiopanspermia" p 184-192 v 90 n 4 Journal of the Royal Astronomical Society of Canada. August 1996. 8.5. "Hubble Takes First Image of a Possible Planet Around Another Star and Finds a Runaway World," Press Release No. 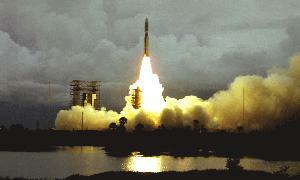 STScI-PR98-19, Hubble Space Telescope News, 1:00PM (EDT) 28 May 1998. Thanks, David S. McKay, for bringing this report to our attention. 9. Fred Hoyle and Chandra Wickramasinghe. Our Place in the Cosmos. J.M. Dent Ltd. 1993. p 34. 10. Fred Hoyle and Chandra Wickramasinghe. Living Comets. University College Cardiff Press. 1985. p 86. 11. David Hume. Dialogues Concerning Natural Religion (1779). Hafner Publishing Company, 1969. p 48. 12. James D. Watson, Nancy H. Hopkins, Jeffrey W. Roberts, Joan Argetsinger Steitz and Alan M. Weiner. The Molecular Biology of the Gene, 4th edition. Menlo Park, California: The Benjamin/Cummings Publishing Company, Inc. 1987. p 596. 13. Bryn A. Bridges. "mutY 'directs' mutation?" p 741 v 375 Nature. 29 June 1995. 14. Timothy Galitski and John R. Roth. "Evidence that F Plasmid Transfer Replication Underlies Apparent Adaptive Mutation" p 421-423 v 268 Science. 21 April 1995. 15. J. Pablo Radicella, Peter U. Park and Maurice S. Fox. "Adaptive Mutation in Escherichia coli: A role for Conjugation" p 418-420 v 268 Science. 21 April 1995. 16. Burt Richards, Hong Zhang, Geraldine Phear and Mark Meuth. "Conditional Mutator Phenotypes in hMSH2-Deficient Tumor Cell Lines" p 1523-1526 v 277 Science. 3 September 1997. Also see "Mutations Surge in Jam-Packed Cells" in ScienceNOW, 4 September 1997. This example in cancerous cells is nonetheless a case where stress increases the mutation rate. 17. Miroslav Radman. "Enzymes of evolutionary change" p 866-869 v 401 Nature. 28 October 1999. 18. John Walker. "Computer Explorations of the Complexity and Origins of Life". This website seriously considers the possibility that human DNA contains a message from our cosmic ancestors. Walker, a co-author of AutoCAD, specifically advocates Francis Crick's "directed panspermia." Walker agrees that such a message would need to be preserved by natural selection somehow. Is the message expressed all around us?